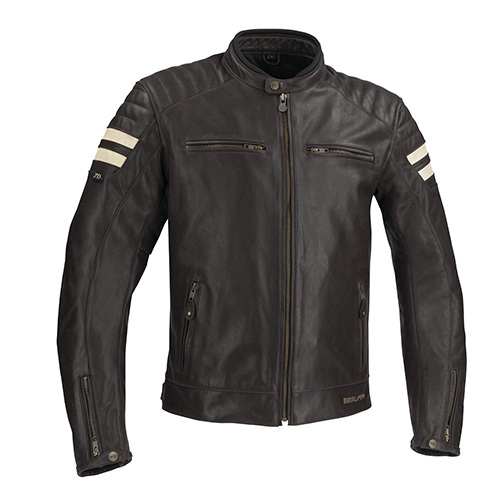 The Segura Stripe is a CE-approved vintage-style buffalo leather jacket with, as you might have guessed, two stripes which wrap around the chest back and arms. There is a removable thermal liner and protectors fitted at the elbows only. There are four outer and two inner pocket plus adjustment at hips and cuffs. The men’s version comes in brown.black or camel with contrasting stripes and in sizes S-4XL at an SRP of £399.99. The ladies’ version has the same spec and comes in brown with cream stripes or black with full-on spangly sequined stripes in sizes 8-16 at £379.99.